Coastal Circulation and Storm Surge Model + SWAN Wave Model: The Coastal Emergency Risks Assessment (CERA) group delivers storm surge and wave predictions for impending or active tropical cyclones in the United States. Updated Sept. 10 at 2 p.m.
With the threat of a hurricane like the destructive Irma comes the threat of a storm surge. The hurricane is expected to bring waves of seawater into low-lying areas of South Florida. The storm surge rarely manifests as a "wall of water" but instead as a rise of water that can be "as rapid as several feet in just a few minutes," according to the Weather Underground, a commercial service that provides weather information online. "If you live near the ocean, the storm surge is the most dangerous part of a hurricane's hazards," the Weather Underground says. Many of the high death tolls from prior U.S. hurricane disasters were due to the storm surge. And, experts caution that the surge can happen before the storm hits land—which makes following evacuation orders even more important. NBC 6's Steve Litz shows us the potential flooding that South Florida could be dealing with in the coming days. 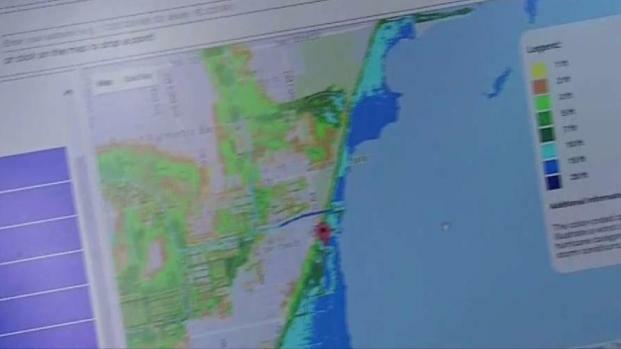 Hydrological and software development experts at FIU's International Hurricane Research Center and College of Engineering and Computing worked with Miami-Dade County to create a web-based application that allows users to visualize the impact of storm surge. The Storm Surge Simulator allows you to enter an address or set a point on a map and choose a category of the hurricane to visualize possible storm surge impact. The IHRC's website warns that the modeling application should not be used to make decisions about how to protect people and property from flooding and storm surge.